Pakistan institute of Fashion and Design admission 2019 are open for fall semester. All the regular students can apply who have done their intermediate with flying marks. Pakistan institute of Fashion and Design PIFD Lahore admission 2019 open now for BS, BDE 4 years degree program and many other department of PIFD. Here at webstudy.pk you can get complete details about PIFD Lahore admission last date, admission schedule, scholarships, Pakistan institute of Fashion and Design Lahore fee structure, PIFD admission form download, Pakistan institute of Fashion and Design Lahore PIFD admission 2019 entry test date, entry test result & interview details are here for all the candidates who are going to appy online for admission in Pakistan institute of Fashion Design Lahore 2019. PIFD lhr admission 2019 complete procedure, Eligibility Criteria, contact information & how to submit admission form in PIFD Lahore. Pakistan institute of Fashion and Design is famous university in Pakistan that is affiliated with Higher Education commission. This university was established in 1994 in Lahore and now become the famous and hec high ranked university in Pakistan. Pakistan institute of Fashion and Design produces many successful alumni like as Maria B, HSY and many others so many of fashion lovers who desire to take admission in fashion institute prefer this university because this university have a unique and comfortable environment for students. Air conditioned classrooms, lecture theater halls, clean labs, play grounds, library, well educated staff, highly qualified faculty & transportation facility. Pakistan institute of Fashion and Design university Lahore admission 2019 last date is 24 july 2019. 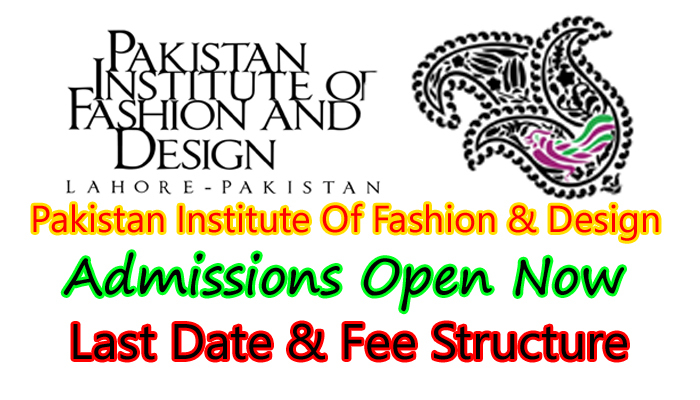 Note that all this information regarding Pakistan institute of fashion and design admission 2019 last date is collected from different sources on internet but for authentic news and updates of pifd admission 2019 advertisement visit official website. Pakistan Institute Of Fashion Design Lahore admission are open for Bachrlor Programs. The candidates who are going to apply through downloaded application form should send Cash proof of online payment of Rs 1400/- against account No. 22167900286001 HBL, Johar Town Branch Lahore. A Level with minimum 3 Main subjects, nosubsidiary and O level with 8 subjects. Intermediate Result is not announced so F A / F.Sc students should attach the attested copy of Part 1 Result card Part-2 Roll No. Slip of their respective Boards. Students who are waiting result can also apply for admission in PIFD admission 2019 but with hope certificate. O-Level students are required to submit Equivalence Certificate issued by IBCC along with A-Level result intimation of at least two main subjects with the form. Applicant pre-admision, Aptitude Test followed by an interview. Pakistan institute of fashion and design scholarships 2019 are also available for those students who need that. Higher education commission of Pakistan like to give deserving students a need base scholarship so that they can study well without any problem of finance. Students must have secured at least 60% marks (first division) in their Intermediate Annual Examination and have admission in any college, university or institute as regular student. Students must have passed the above mentioned examination from a government institution.